It was a weekend of missteps. We thought the Farmers Market was on so made the trip to New Ferry on Saturday afternoon but the car park was empty and we will have to wait until next Saturday to buy our roast chicken. It appeared that someone may have taken on Strut Your Stuff as the sign was being painted over. 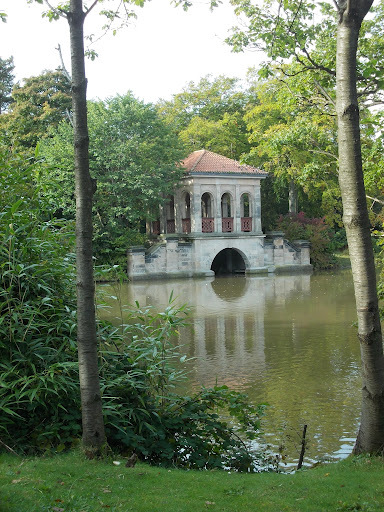 On Sunday we walked down to Birkenhead Park to see the old car rally only to find that we had missed it. So it was a walk round the lake instead imagining the boats that would have parked by the boathouse a hundred years ago. 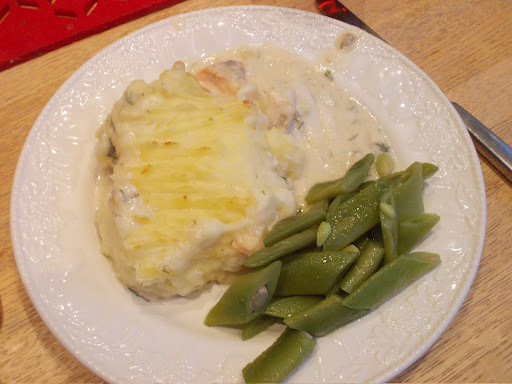 On the way back from New Ferry I stopped off at Wards to buy the ingredients for a fish pie – a slab of smoked haddock and a mixture of salmon and cod ends- then into the greengrocers to get a bag of potatoes for mash. 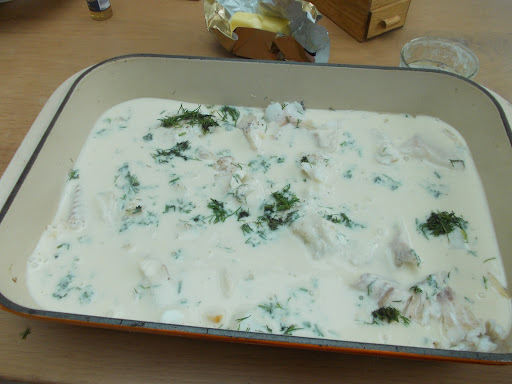 I poached the fish in milk seasoned with a couple of bay leaves, an onion stuck with cloves, salt and peppercorns. I made the mistake of adding a large cup of cider to the milk which curdled it over the heat. 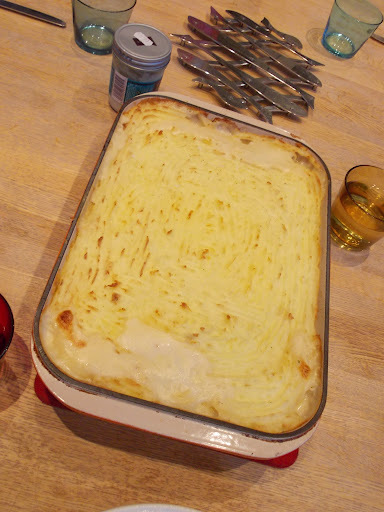 I think I must do this every time I make fish pie. Earlier that afternoon I had dug up my first horseradish root. 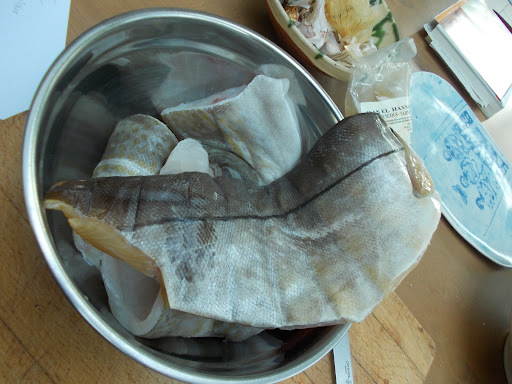 We tasted a couple of thin slices, the fine heat of it clearing heads and noses. 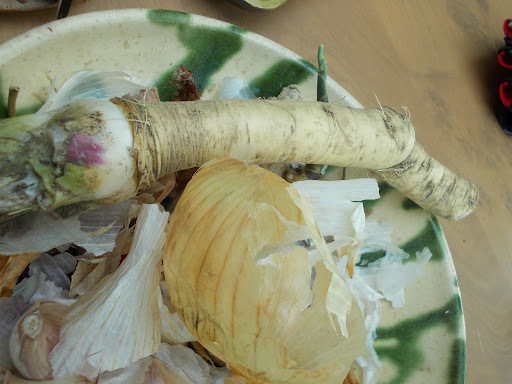 We will need to find something to cook with horseradish. Once the fish was cooked I let it cool for a few minutes until I was able to handle it. 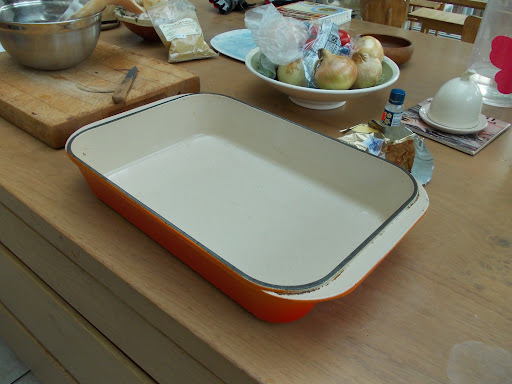 I then peeled off the skin and put the bite sized chunks of flesh into the large orange Le Creuset dish, flaking the larger pieces. My fingers were sticky with the hot milk and the just cooked skin. 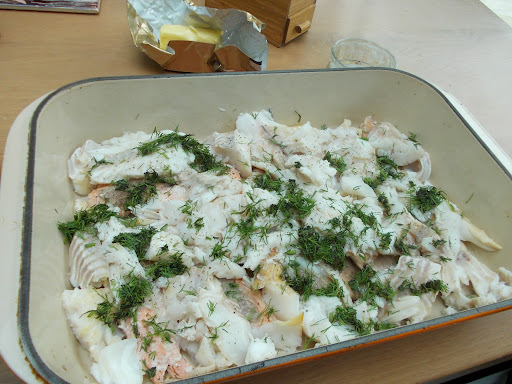 There was some dill left in the bottom of the fridge and that was chopped up finely and scattered over the fish. I strained the split milk and cider into a jug and then started on making a white sauce. A good chunk of butter went into a hot pan and once that was sizzling I added a good tablespoon of flour. I beat the butter and flour with a wooden spoon and let it cook through for a few minutes. I then added some fresh milk beating hard with the wooden spoon to avoid any lumps. Once it had taken I added the milk and cider and brought it all to a slow simmer, stirring all the time until I had a silky smooth white sauce. Once that was ready I took it off the heat and stirred in three large spoonfuls of creme fraiche and a dash of mustard for flavouring and then a final seasoning of salt and pepper. The sauce was poured over the fish and then dish was then put to one side in a cool place whilst I did the potatoes. 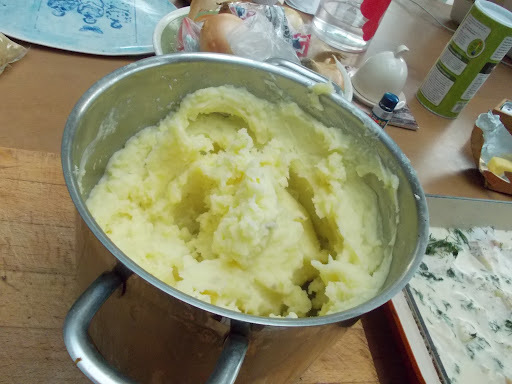 The potatoes were boiled until soft, drained and mashed with another good hunk of butter and some more splashes of milk. they were given a further seasoning of salt. 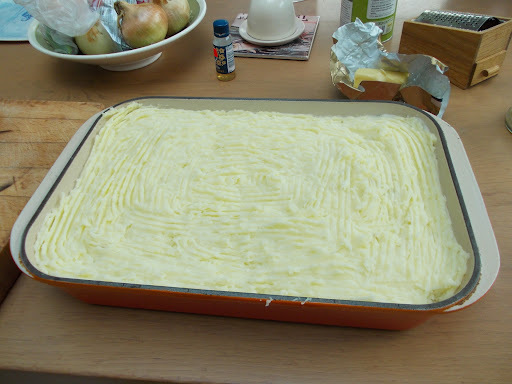 One of the most satisfying aspects of making a potato pie is laying the mash over the top and smoothing it down so that it completely covers the fish underneath. I got the amount of potato just right and there were no awkward gaps. I made a rough ploughed field pattern with the tines of a fork and scattered the top with some more small cubes of butter. It all then went into the oven for 30 minutes until the white sauce started to bubble up through the potato. We ate it with green beans from Dad’s vegetable garden and Stokes Tartare Sauce. We listened to The Poet by Bobby Womack on vinyl. Getting up every 20 minutes to turn it over. One of the kids asking if you can play the other side as well.